Gyurza (the Viper Levytska) is a representative of the Viper family. It belongs to the genus of giant vipers. Its body length can reach 2 meters and its average weight is about 3 kilograms. This reptile is poisonous. Basically this kind of snake lives in Central Asia. This reptile lives in Afghanistan, Northern India, middle East, Arabian Peninsula, Pakistan and Iran. And it can be found in the Caucasus and Kazakhstan, and on the North African coast, which is adjacent to the Mediterranean sea. It is almost impossible to meet snake, the Viper in Europe. The only exceptions are some Islands in the Mediterranean. Gyurza forms a separate species, which includes 5 subspecies. Each subspecies has its own habitat. The body of the male may have a length of about 1 meter, and females 1.5 – 2 meters. 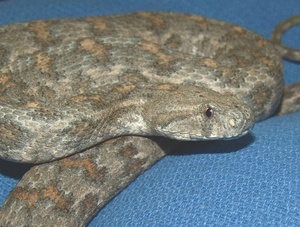 Head triangular, wide, rounded snout. Protective flaps over the eyes. Face, head and body covered with scales. The color of the head of the same type. Very rare to see it spots V-shaped. 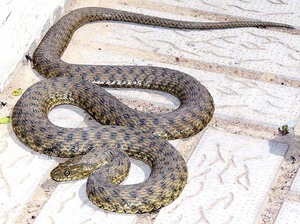 The serpentine back has a light brown or gray. The belly is light in color with small dark spots. This snake species is quite common. Their habitat range from Northern to Central Africa, the Middle East, northwestern India. Very often you can find its various subspecies on the Islands of Sifnos, Polino, Kimolos, Milos and Crete. On the territory of the former Soviet Union GURZA can be found in these countries: South Kazakhstan, Western Tajikistan, Eastern and southern Uzbekistan, southern Turkmenistan, Eastern Ciscaucasia and Transcaucasia. On the territory of Central Asia and the Caucasus this snake’s name is Viper, but in other countries it is called the Eastern or Levant Viper. In addition to these names, the locals gave her the nickname, depending on the country of habitat. Characteristic of this snake areas are quite similar throughout the area of her residence. The cliffs in the river valleys. Mountain slopes and gorges, which are overgrown with bushes. In the mountains, this reptile inhabits is not above a mile above sea level. People she is not particularly afraid. Because it does not escape, vineyards and gardens, banks of irrigation canals, cultivated lands. And she can crawl into residential and non-residential premises on the outskirts of villages. Its shelters are secluded and quiet location of burrows of rodents and other mammals of smaller size, fences, composed of stones, openings in the cliffs of the rivers, crevices in the rocks. These reptiles are quite mobile, and most susceptible to migration of those individuals who live on the mountain slopes. Viper winter large aggregations of individuals in the crevices of rocks, and after the winter spreading in a different area. Serpentine summer migration occurs due to temperature. When the summer heat starts they are with the foot of the mountains will slide closer to the water. During the heat, they drink a lot of water and love to swim. The first Viper to crawl out in March or April. Waking up after hibernation, at this point, they are passive. They bask in the sun and slowly waking up. Hunt immediately. In this period of their activity takes place during the daytime, and at night they crawl into a hiding place. When it comes to the heat, the way of life of reptiles change. Gradually, they begin to show their activity and at night. In the summer their activity falls on the sunset of the sun and the first half of the night. When autumn comes, they again begin to hunt only during the day. And in October they go to spend the winter. Grown snakes feed on small mammals (house mice, voles, gray hamsters). Individuals are more adults can easily overcome such foods as: amphibian, a small rabbit, rat, jerboa, gerbil. In their menu there are a small number of baby turtles and their eggs, phalanx. Small animals are the main food of snakes. Some snake species in the spring and autumn period often prey on birds. Viper prey on birds in a variety of ways. They start from ojidaniya victims on trees and shrubs, and ends with the ambush and ojidanie birds near water bodies. Their victims are small birds from sparrows to doves. But priority — passerines. The snakes that live in the vineyards, a slightly different tactic hunting. In the fall the reptile crawls on vines and it is hiding, hiding near ripe bunches of grapes. Flocks of sparrows flew over the grapes, come across reptiles. At the same time Viper grabs the prey in its mouth and would not let her that the victim had to crawl on the ground. When pass 1 minute, the snake venom paralyzes the prey. At this point the snake swallowing it and again starts to hunt. Mating season of these reptiles is April and may. The little snakes are born in early autumn. But they are born in different ways. In most species this birth are called live born, but in the Central Asian Viper lays eggs. The incubation period is 40 days. The eggs are covered with a translucent thin film. Embryos sufficiently developed. The shell provides for an easier birth and receive enough oxygen. After making the egg shell a hole of small size, such even during the day not in a hurry to get out of his hiding place. Newborn snakes have a weight of 10 to 14 grams and a body length of 24 cm. The total number of eggs can vary from 15 to 20 pieces in one batch. For a person is very dangerous the bite of a Viper. When you bite into the human body gets about 50 milligrams of the venom of a Viper, which is very toxic. On the effects of the toxins he is second only to the Cobra venom. The Viper’s poison consists of enzymescapable of destroying red blood corpuscles and the walls of the blood vessels, and cause blood clotting. For this reason, after the snake bite, there are numerous subcutaneous and internal hemorrhages, under the action of the poison of small blood vessels burst in the area of the bite is very swollen, clogged the middle and large blood vessels due to blood clotting. All this is followed by vomiting, dizziness, severe pain. If time does not take the necessary measures, it can be fatal (10% of cases). Skilled and timely assistance with the use of serum protivodymnoy will avoid unwanted consequences. But in pharmacology and medicine, the Viper’s poison use. Because of this, in the former USSR was created special slaytanic, where he extracted snake venom. Were such nurseries in Termez, Tashkent and Frunze. These reptiles were kept in large clusters. They are very hardy, provide a large quantity of venom and longer than other types of reptile can live in captivity. One take can be selected to 0.2 grams dry. 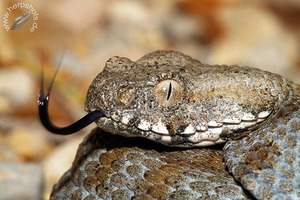 The Viper’s poison is used for the manufacture of drugs and for protivodymnoy serum. The Viper’s poison in their properties unique and superior to almost all poisons of other snakes breed Viper. Properties and chemical composition is very similar to the venom of the chain Viper. From the venom of a Viper scientists have created a drug as a “Lebeux”, which is required for people with hemophilia (congenital incoagulability blood — congenital type). In addition, the venom of this reptile is used for diagnosing various complex diseases such as leprosy and tumor malignancy at an early stage. 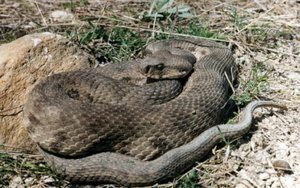 Due to the fact, that the poison of this snake is so valued by medicine, zoologists thoroughly study the habitat of this reptile, identifying the mass centers of the clusters. These places are created sanctuaries snake, where the reptile is protected. The bite of a Viper: deadly whether it is for a person or not?